Multi purpose chain driven two post vehicle lift, with asymetric lifting arms, suitable for vehicles up to 3,000 kg. Hi tech, low maintenance, automatic lubrication & advanced safety features for chain failure, safety lock on lift arms. 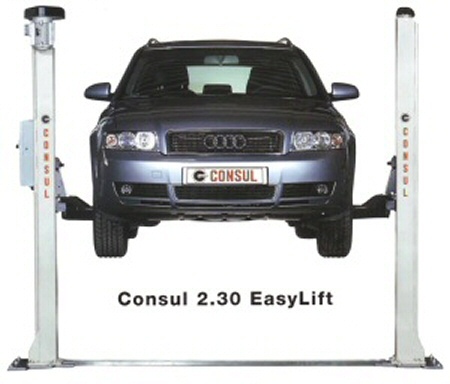 Consul 4.40 series - 4 post lifts. 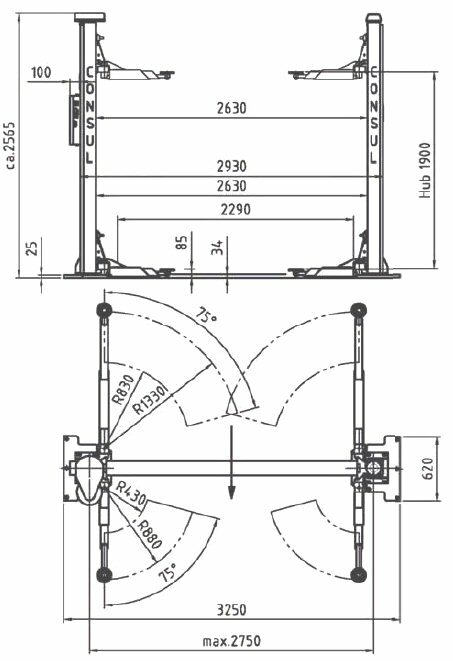 The Consul 4.40 series is a new generation of 4 post lift using an electronic control system. The Consul 4.40 series 4 post lift can be equipped with a wheel alignment kit with full length side slip plates (rear) which use a unique suspension system to protect the roller mechanism bearings from water and dirt ingress. It includes adjustable turning plate recesses with cover (front) which can be positioned as required using a modular system. The Consul 4.40 K four post lift. The 4.40 K mid range Consul four post lift useful for small workshops, yet with platforms 4440mm long and 500mm wide it will still lift the largest passenger cars and also small transport vehicles. Wide spacing between the columns allows excellent access, the tough rigid construction provides stability for wheel alignment and a lift height of 1850 mm (just over 6 feet) means it is comfortable for even tall mechanics to use. The larger 4.40 BL version can accommodate long wheel base vehicles such as Iveco Daily, VW-LT, Sprinter & LWB Transit. Lift height 1850 mm (just over 6 feet) for tall technicians.